Nice shot. I wish she was wearing a cowboy hat. A little blown out on her back. Good candid. A little cluttered. My eye doesn't quite know where to focus. I like this. 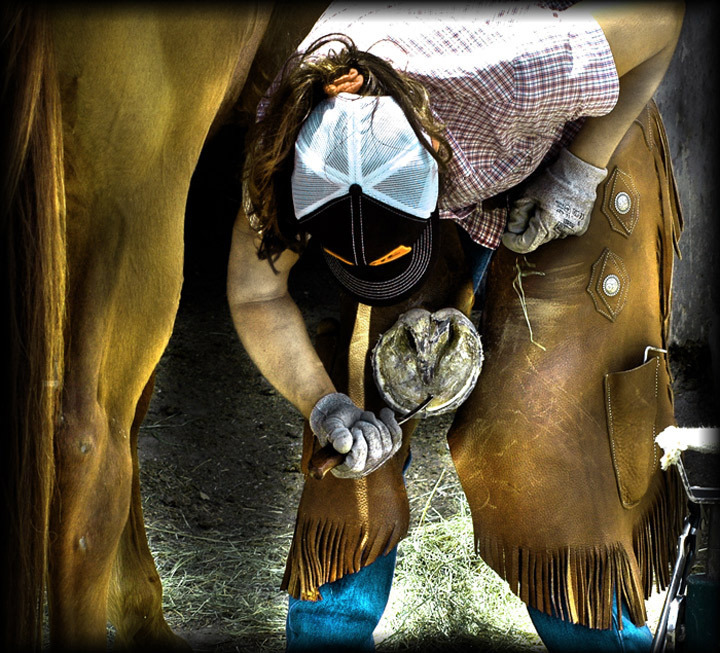 It takes a while to figure it out... even if one is familiar with farriers, as I am. Well done. I'm guessing this is Susan's! Wonderful angle/perspective! I like the environmental portrait feel to this. I'm a little uncomfortable with the extreme processing - seems substantially overworked IMO. Creative take on the challenge and well executed. An important person that all horsemen need but not typically considered by the general masses. The composition works well to take your eye to the hoof. The post processing works well here and creates a moody feel to the shot. You may want to try cloning out the marks on the horse's leg (just to experiment). Proudly hosted by Sargasso Networks. Current Server Time: 04/20/2019 02:13:49 PM EDT.